The Livingston family connection with Monyabroch was not entirely severed with William's deposement (recorded further on) and subsequent transfer to Lanark in 1613. The Livingstones ( the `e` was used at this time by this branch) of Kilsyth, that had a common ancestor in Sir William Livingston, Lord of Callendar who was slain at the Battle of Homildon Hill in 1402, were granted the Viscountship of Kilsyth in 1661. Tragically, the title was only held by three persons before it became extinct. 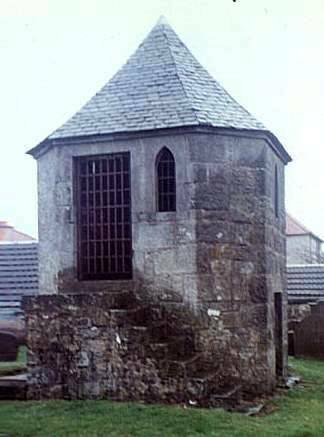 The mausoleum that now occupies the spot on which the sixteenth century Monyabroch Kirk once stood. Erected in the the 19th century, the large tomb was built around an old vault that had once been part of the old church. This is the only material remains of the building that included among its ministers, Alexander Livingston and his son, William. The vault contains the earthly remains of one, Jean Cochrane and her son who died tragically in 1695. The story of their demise is carved into the stone on one face of the edifice in the following inscription. `Jean Cochrane, wife, and son of William Livingstone of Kilsyth. Deaths caused by falling in of roof, composed turf of a house in Holland. Mr Livingstone was with difficulty extracted. Lady, child, and nurse were killed , October 1695. `In 1795, vault over which the church at that time stood, having been accidentally opened bodies of Lady Dundee and her son which had been embalmed and sent from Holland were found in a remarkable state of preservation and after being for sometime exposed to view, the vault was closed. `This lady was the daughter of William, Lord Cochrane who predeceased his father, William, 1st Earl of Dundonald. She married firstly John Graham of Claverhouse, Viscount of Dundee killed at the Battle of Killiecrankie, 1689 and secondly the Honorable William Livingstone who succeeded his father, James as the third Viscount of Kilsyth 1706. Lord Kilsyth married secondly Barbara, daughter of MacDougall of Makerstoun but dying under attainder at Rome, 1733. The Viscountship had originally been bestowed on James Livingstone on 17th August, 1661 by Charles ll for his `services to the Crown and sufferings for the Royalist cause.` Ironically, this coincided with the period that John Livingston was enduring the harassment for his non-comformity and his subsequent trial and banishment. Sir James did not live long enough to reap the benefits his peerage would bring him for, within a few weeks, he died on the 7th September the same year. The title passed to his elder son, James, but he died without being married. William succeeded him in 1706. This family was descended from the same line as John Livingston. However, the legend fails to relate the complete story behind the unfortunate occurrence, a hint of intrigue being suggested, if a local belief at the time is to be true. Born on 4th March, 1650, William chose a military career after leaving Glasgow University and obtained a commission in the Royal Scots Dragoons (Grey Dragoons), later to be retitled the Royal Scots Greys. He became Lieutenant-Colonel of the regiment and rode with it into England in 1688 as part of the Scottish Army. He succeeded the Earl of Dunsmore as Chief-in-Command of the Dragoons before he himself was replaced by his own relative, Sir Thomas Livingstone, an appointment directly commanded by King William. On his return to Scotland with the Regiment, Livingstone was arrested on the orders of General McKay, suspected of sympathising with King James, and being in correspondence with Claverhouse, Viscount Dundee. Along with several other officers similarly suspected, he was sent south from Aberdeenshire and incarcerated in the Tolbooth, Edinburgh. Viscount Dundee was slain at the Battle of Killiecrankie in the hour of his victory. It was claimed, by local tradition, that William Livingstone had been present at the fray. Not only that, he was said to have been responsible for inflicting the wound on Dundee that led to his death. This was alleged to have been his intent to enable him to marry Jean Cochrane, Claverhouse`s widow. He did in fact marry the lady, but his imprisonment coinciding with the battle was indisputable evidence of his absence from the field, let alone his seeming involvement with Dundee's death. Further, he sympathized with Claverhouse`s cause and was in dread of losing his own head as a result. The penalty for returning without the King's permission would be £1,000 sterling (£12,000 Scots). His liberation took place on 10th May, 1694 after which he left for Holland. It was on the 15th October, 1695 that he suffered the loss of his family. While sitting at home in their house in Utrecht, the roof of the building collapsed about them. He alone was pulled alive from the wreckage. The bodies were recovered, and after embalming, were brought back to Scotland. In 1685 he had represented Stirlingshire in Parliament for one year. He resumed his political career in 1702 before he was elevated to the peerage after the death of his brother in 1706. His estates were forfeited. Livingston, the third Viscount Kilsyth, died in his adopted city on 12th January, 1733 and with him the title.